Warwickshire have brought in former England captain Graham Gooch as a part-time batting consultant. 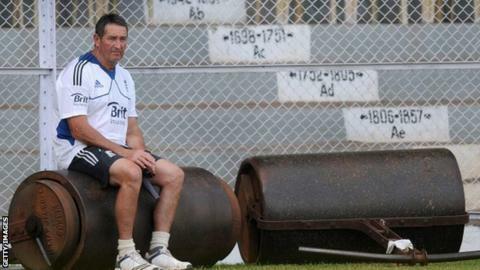 The 62-year-old former Essex coach, who scored 8,900 runs for England in a 20-year Test career, has been helping to coach the Bears batsmen in pre-season. And he will remain in touch with the county throughout the summer. "His job isn't to change people in any dramatic way, just to offer advice. He talks a very straightforward game," said director of cricket Dougie Brown. "Graham is a very impressive bloke whose record speaks for itself. For our guys to get advice from somebody like him is pretty powerful. We think it will pay huge rewards. "He doesn't pull any punches. Having him around will just bring that extra expertise to us as we try to be as well-equipped as we can possibly be in all departments." Gooch worked with new Bears skipper Ian Bell and team-mate Jonathan Trott in his five-year stay as England batting coach. Gooch and Bell have remarkably similar Test records. Both have played 118 Tests. Gooch, who made 20 Test centuries, averaged 42.58. Bell, who currently averages 42.69, has made 22 centuries for his country. Edgbaston was the scene of Gooch's Test debut four decades ago, when he made a First Test pair against Australia in 1975. Warwickshire's batting coach for many years was former batsman Neal Abberley, until his death in 2011, since when another of their former players, ex-wicketkeeper Tony Frost, has been in the role. Gooch, who has already completed two of his scheduled four contracted coaching days with Warwickshire, will retain his links with Essex, where he spent the whole of his county playing career. A statement released by Essex said: "He will continue to give considerable financial support to the Essex Cricket Academy and future Essex cricketing talent, through his scholarship fundraising. This support has been ongoing for the past 14 years since Graham was given the honour of being appointed Essex head coach." "Graham will continue to be a valued member of the cricket committee, and club ambassador at Essex County Cricket Club." Gooch held the head coach's role for Essex until being replaced by Paul Prichard in March 2005, after which he worked as a batting coach until joining the England coaching set-up.